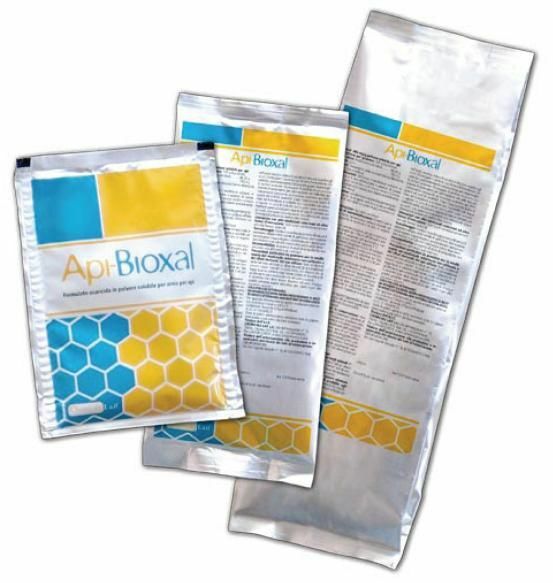 Api-Bioxal is a brand new Oxalic Acid based veterinary registered product for the control of varroa. We stock 2 sizes, 35g sachet will treat up to 10 colonies, a 175g sachet up to 50 colonies. The treatment is best used during the broodless period in winter which would be around late December to January but will vary as our seasons fluctuate. Api-Bioxal can be used when there is brood but this will effect the efficacy as varroa in sealed cells will not be targeted. Treat all colonies in the apiary at the same time to avoid re-infestation of varroa. For summer treatment to get the maximum efficacy stop the queen from laying for 25 days prior to treatment. In the spring treat new swarms and shook swarms before the queens start to lay. Api-Bioxal can be administered using the trickle method or by vaporisation. In either case make up a sugar syrup using warm water as per the quantities below and add the powder in the sachet, shake until dissolved; ensure you use the correct quantities for the sachet size as this will affect the efficacy. This will make up a 4.2% solution. The treatment should be made and administered in one dose. Trickle Method: Using a syringe trickle 5ml of the prepared solution down the seams of each brood frame of bees. If your colony has 5 frames covered in bees you will need 30ml of solution. Vaporisation Method: Apply using a commercial vaporiser and ensure you follow the manufacturers instructions paying close attention to the safely instructions. You will use 2.3g of Api-Bioxal per colony. Place the power onto the vaporiser and put the device into the hive entrance, avoid it touching the underside of the frames. Seal the entrance so stop any bees escaping then turn on the vaporiser as per the manufactures instructions for about 3 minutes. Once the treatment has been completed keep the hive closed or a further 10 minutes. Be aware the vaporiser will be hot so ensure you take care. Read the usage advice below for treating with a vaporiser. When handling the product wear suitable gloves, face mask and glasses for protection and especially important if using the vaporisation method ensure you wear a FFP2 face mask and full glasses. Treat all colonies in the same apiary the same time for maximum efficacy and to discourage robbing - trickle method.